Jop Delemarre has become the second Dutch Open Champion Superchess in Wijk aan Zee. The International Master (ordinary chess) remained unbeaten and secured his unshared first place with 6 points and the first prize of 250 euro by drawing in the last (7th) round. Delemarre thus took the title and the challenge trophy from Tom Bottema who, like many others in De Moriaan, was unfortunately eliminated by fever and therefore unable to play. The 3rd Dutch Open Superchess Championship next year at Corus offers the two champions a beautiful opportunity to meet each other on the board in order to compete for the highest Superchess honour. Yme Gorter, rising young chess talent from Leiden, secured the unshared second place with 5.5 points and the second prize of 150 euro. The third prize of 100 euro was shared by Fred Kok from Heemskerk (fourfould world champion LOA - Lines of Action), Stef van der Zon from Warmond, Jochem Snuverink from Amsterdam and Giel van Rijn from Leiden, each with 5 points. The two rating prizes went to Yme Gorter and Giel van Rijn. The prize-giving ceremony was held in the VIP-room of De Moriaan, also the playing room; an excellent location for this unique tournament. On behalf of main sponsor Danieli Corus, Frank van Gool presented the new titleholder with a work of art for a keepsake, showing, among other things, a chessboard with two Amazons (Queen plus Knight combinations) and a blast-furnace as King. Ex-champion Bottema, meanwhile sufficiently recovered, presented the new champion Delemarre with the challenge trophy - a silver Amazon, manufactured by the artists Mr. and Mrs. Stammis. Arno Vrins, Superchess-promoter and treasurer of the Corus Chess Committee, distributed the cash prizes. In his address Vrins expressed his hope and expectation that the 3rd Dutch Open Championship Superchess during the 68th Corus Chess Tournament, January 13-29, 2006, will count even more participants. "The partitioning wall can be removed after which the VIP-room would provide accommodation for more than 60 players", said Vrins. Main sponsor Danieli Corus had a pleasant surprise to conclude the ceremony. 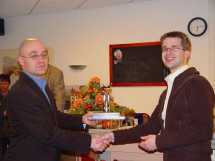 Frank van Gool rejoiced each participant with a bath towel showing a picture of the Amazon and the text "Superchess 2005". A genuine collector's item which one should not leave unattended at the beach! The 2nd Dutch Open Championship Superchess has become a great success. Arno Vrins, Superchess-promoter at the Corus Chess Tournament, could register 32 participants, including two International Masters: IM Jop Delemarre and his wife WIM Isabel Werner. 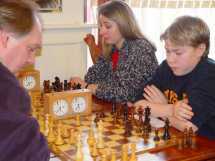 Consequently the players' field was stronger than at the 1st Dutch Open Championship Superchess with 24 participants. Moreover, in the meantime many players were better trained so that the level of play was higher than last year. Winner Delemarre expressed himself very laudative on this new type of game. "I certainly want to play more Superchess", said the new champion. It is gratifying that this was the first international tournament by the entry of Sande Oddmund from Norway. Even more satisfying was the strong representation of the ladies. Apart from WIM Isabel Werner, also Marion Adriaans, the wife of the Dutch Chess Champion, GM Loek van Wely, and Delia Keetman from Heerhugowaard had registered. Isabel and Marion were slightly handicapped because they had been invited to pose for a portrait by Fred Lucas, photographer of the Corus Chess Tournament. Due to lack of time the ladies had to pose during the tournament which did not help their concentration on the games. To pose requires concentration of a kind different from concentration on playing Superchess.Their score of 4 points each was therefore not without merit, also in view of their short preparation time. On the final day of the Corus Chess Tournament, Sunday, January 30, 2005, commentator IM Hans Böhm briefly raised the well-known problem of the too large role of the opening theory, during the commentary session in the Corus Chess Pavilion. "Who knows a good solution to this problem? Perhaps we should sometime look at Fischer Random Chess or Superchess? ", said Böhm. To many chess players it is obvious that the large role of the opening theory constitutes a problem, ànd that this problem is increasing year by year, but the big question is how this problem can be best solved. Fischer Random Chess, or Chess960, constitutes a possible solution. In this variant the chess pieces are set up on the back rank in a random way, but subject to a few restrictions, which results in 960 different starting positions. 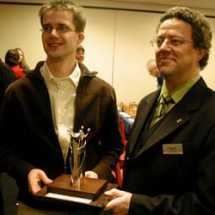 The grandmasters Peter Leko and Peter Svidler, the numbers 5 and 8 of the world rankings, are regular players of Chess960 in the well-known Chess960 Tournament in Mainz, Germany, each year organized by Hans-Walter Schmitt, chairman of the Frankfurt Chess Tigers, see http://www.chesstigers.de. Superchess does not have any opening theory (yet). Moreover, in the future it will not be efficient to study any opening theory because there exist (too) many different starting positions. Superchess introduces (a few) new pieces having different movements, for example, the Amazon moving like Queen or Knight and the Princess moving like Bishop or Knight. These introduce new, magnificent tactical possibilities which make the game even more fascinating and enthralling than chess, whereas the character of chess is preserved. At the Dutch Championship four of such superchess pieces (combinations of chess pieces) have been used. These are put into action before the actual combat, in the so-called prelude, by replacing in the ordinary set-up of chess, four chess pieces with the four superchess pieces. Both players have to deploy two superchess pieces as desired. The first game of Superchess requires more brainwork than a game of ordinary chess, because one lacks the standard patterns by which many chess moves go "via one's spinal cord", as it were. To play chess by experience is of course less tiring. Playing Superchess reminds one of the time when one learned how to play chess. Naturally one has to get used to the new pieces, but the learning process goes surprisingly fast. The big advantage is that (opening-)homework is unnecessary. To appear fit at the board now is the main requirement. Many former chess players who quitted because of too much homework, certainly will appreciate Superchess. Now that databases contain millions of games, more and more grandmasters (including Garry Kasparov) consider the huge opening theory as a burden that requires (too) much preparation time. Perhaps even more important: Too much theory kills the creativity during the game. It is these days not uncommon that the first 25 or 30 (!) 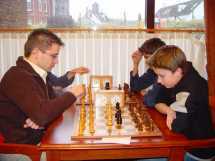 moves of a chess game are played "from the book". Superchess offers a fascinating and natural extension of chess, having the same character but no opening theory. So it is not surprising at all that Superchess currently draws more attention and counts more and more aficionados, also under (grand-)masters. For example, GM Peter Leko, the unshared winner of the recent Corus Chess Tournament 2005, is definitely favourable to Superchess, just like GM Daniel Stellwagen, IM Jop Delemarre and WIM Isabel Delemarre. 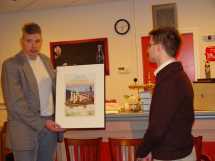 The tournament leadership was again in the competent hands of Cees Lute and Frank van der Heijde, just like at the 1st Open Dutch Championship Superchess, January 24, 2004.